Assassin's Creed has been one of those series that I really enjoy, but not enough to buy at full price. I'm perfectly content to wait for the games to come down in price, and as such I'm a little behind the times. So over the holidays I decided I should start playing Assassin's Creed Brotherhood. So far I'm quite enjoying the game, more than I enjoyed Assassin's Creed II almost 2 years ago. However I can't help but notice some very glaring issues that cause me great frustration, and so I thought I would talk a bit about those issues here today. Specifically they all seem to revolve around the concept of restricting the player. In itself player restriction isn't necessarily an issue, but the way the game does so makes it one. Before I begin in earnest, there are a couple of things that I want to point out. First of all, I can't claim that any of the things I will discuss today were not present in Assassin's Creed II. It was a while ago that I played it, and I payed less attention to design back then. It's not a matter that even really matters. "It was that way in the last game, too" doesn't invalidate an issue. On a similar note, I am going to be comparing Brotherhood to "other games" a lot in this post. To that end I just want to emphasize that a design decision is not correct simply because another game (particularly a successful one) does it. I reference other games because they made what I consider to be a better decision when faced with a similar problem. Now that we have that out of the way, let's look at the first and probably biggest issue Brotherhood has. It restricts where the player can go. As I stated earlier, restricting the player isn't a big problem. Assassin's Creed is an open world game, and plenty of open world games restrict where the player can go, usually until some later point in the story. It's all a matter of perception on the player's part. Most the games have the sense to make these restrictions logical. Perhaps a bridge is up, or a barricade is in the way, or perhaps the player needs some form of upgrade to get there. There is a good reason you can't go there, it makes sense, and often times finally getting access to that area incorporates some amount of story or gameplay. Perhaps even more importantly, the player is usually never given the impression that they can get there. There won't be any icons on the map of that area, there won't be any temptation to get there other than pure curiosity. Finally when there is a restricted area, the division is pretty clear. The restricted area is usually a city, or an island, connected by bridge or some other such. 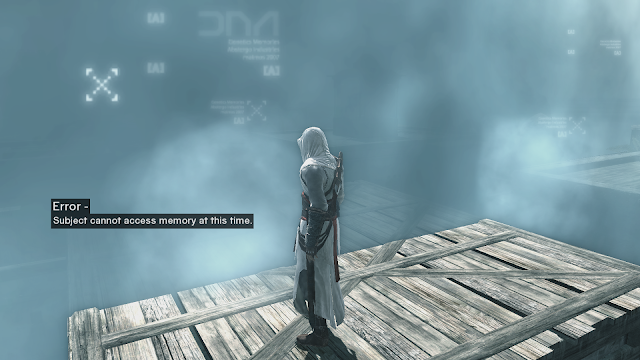 Assassin's Creed Brotherhood does all of these things wrong. The player is not given any indication which areas they cannot go to until they are practically inside the area. At that point a large semi-transparent white wall appears. This isn't even a solid wall mind, you can walk right past it, you just die if you do. Who thought that was a good idea? The worst part is that it just feels like a very arbitrary division. The game explains that this area isn't available yet, and it makes sense in the game's plot, but it feels like a flimsy excuse. When you are standing there you see an area that is just outside your reach. You see NPCs walking in and out of it. You see icons on your map tempting you into this dead zone. Even despite the game's explanation of why you can't go in there, it doesn't make sense to your brain. This is clearly an area that should not be restricted, and yet the developers have decided that you cannot go there yet. Clearly the answer is to erect a giant invisible (but not impassable) wall all the way around this area! Yea, clearly the best idea is to put magical walls right where the player is not going to expect them, rather than at a logical division spot like a bridge or an actual wall. Let me give you a specific example from my own experience with the game. I have this obsession with hitting up viewpoints. Viewpoints uncover more of the game map and allow you to see other icons, marking your other objectives. All the viewpoints are marked on the map from the very start. 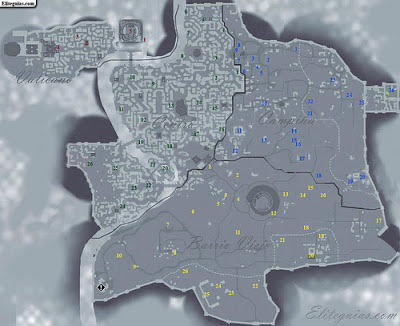 There is one in particular that I wanted to hit up in the north east of the map. However for about half the game it is just outside of your reach. You can run right up to it. You can see the tower, you just can't go there. So I would frequently check this area after completing story objectives to see if I could go there yet. Gradually the surrounding area became more available, but not the area I actually cared about. At one point I was even given a story mission that took place further to the east, past this inaccessible area. I thought surely this meant I could now use the viewpoint I had been waiting for. Not so much, though. No, instead the game made me run all the way around this area. I had to follow the taunting white wall all the way to the south and around it. I know now that, it's not even like the tower I wanted to climb was related to a story mission. For whatever reason the developers just decided they should taunt me with this tower, put it directly in my path, but not allow me to use it. Area accessibility isn't even the game's only issue, in terms of restriction. See, the whole plot of Assassin's Creed is about reliving the actions of the protagonist's ancestors. So a lot of restrictions are put in place with the reasoning that "That didn't actually happen", and rather than dying the player simply de-synchronizes. It's a clever way to maintain narrative, but it really gets in the way. I mean what kind of open world won't let you kill annoying civilians (especially when they make a point of having civilians designed to annoy you). That's the least of the game's issues in this regard, though. The game is chock full of what I usually just call "BS death". I mean sure, it makes sense that you should aim to be stealth in a game called Assassin's Creed. Do the requirements really have to be so rigid thought? Let's say that I have to Assassinate a target. The game will force you to remain undetected, and will kill you if you become discovered. Why does it have to kill you? Why can't he just call the guards and run away, forcing you to find him again? If I'm breaking into a castle and I get discovered, why do I have to immediately die? What if I kill the guard before he actually says anything? What could that guard have realistically done in the 1/2 second he noticed me? If I come upon a group of three guards, should I not have the chance to at least stop them from raising the alarm if I'm discovered? The point here is that, it seems like the only failure state the game has is death, and that's incredibly annoying, un-inventive, and yes restrictive. Honestly, I don't care about the narrative of how awesome my ancestors were. 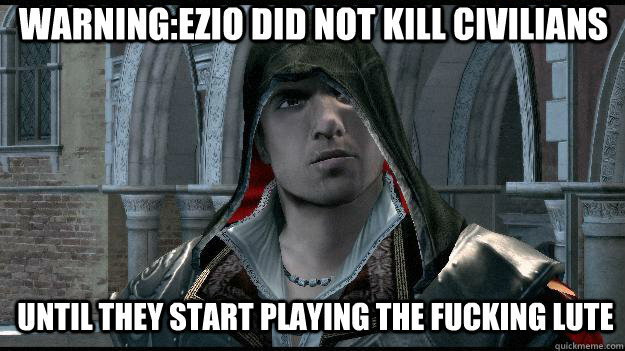 I don't care if Ezio would not have been discovered. I want a failure state that punishes me without forcing me to start everything all over again. Make it harder for me to proceed, but give me a chance to redeem myself. All told, Assassins Creed Brotherhood is probably the least open world open world game I have ever played. For whatever reason the developers decided that they needed a stranglehold on where the player can go and what they can do. This is kind of strange considering how contrary it is to the spirit of an open world game. That's not to say it's a bad game, it's the best Assassin's Creed I've played so far. Looking at the design I really have to wonder why Ubisoft made the decisions they did, though.